Freedom of choice: it’s more than just a slogan on the side of a 64 oz. Double Big Gulp. 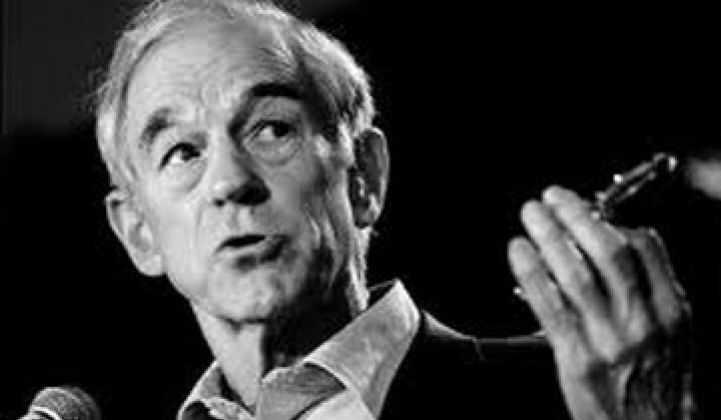 Ron Paul, the onetime presidential candidate who claimed that the U.S. government would force you to get a doctor's prescription for vitamins, has joined the light bulb wars. Paul, a Congressional representative out of Texas, has joined with Joe Barton and 19 others to repeal the 2007 Energy Independence and Security Act. The law, among other provisions, creates regulations that would phase out inefficient incandescent bulbs. Earlier this year, Michelle Bachmann mistakenly attributed the law to the Obama administration. It was passed by Bush. Bush also promoted ethanol production; W. is beginning to look a downright lefty these days. The Center for Competitive Enterprise, a web-based group founded in 2009, has called the law an "outrageous" limitation on consumer choice. There are a few ironies here. First, light manufacturers have already begun to phase out incandescents in favor of solid state lighting, so repealing the law would actually hurt manufacturers. Consumers and businesses would also suffer in the long run because of the higher power bills that the prolonged consumption of incandescents will cause. A new and burgeoning industry would also shift overseas: China, Europe, Australia and several other nations have passed laws phasing out incandescents and promoting solid state lighting. Fred Upton, the Republican Congressman who is attacking the EPA, was one of the chief sponsors of the 2007 law. To date, Bachmann and Paul have yet to attack Upton for this, but hope springs eternal. In the end, repealing the law would likely hurt the economy, drive up the price of power, hurt us competitively and make us even more reliant on foreign exports. Thus, it will likely become popular with some segments of the voting public. It probably won't pass, but it won't go away quietly either. --BMW created a $100 million venture fund. Strategic VC investing has been an increasingly prevalent fixture in green. General Motors, TSMC, UMC, Intel, Cisco, Bosch, ABB, General Electric, Dow and others have all created funds or have actively invested in startups. We applaud BMW's efforts, but it remains to be seen how serious the effort will be. VC investing is simply not as popular in Europe and among European companies as it is in the U.S. or Asia. Car companies, historically, are also reluctant to incorporate outside technology into their products. BMW has also been less active in promoting electric cars than even domestic rivals like Volkswagen and Daimler. The all-electric Mini is a prototype, not a production car. So, this is a wait-and-see. --The California legislature passed a bill that would make the goal of getting 33 percent of the state's power from renewable sources by 2020 into law. Right now, it's just an executive order. Count on this one passing. California has passed a 20-percent-by-2010 law. The three big utilities missed it, but will likely achieve compliance by 2012, or one year before the grace period ends.